Alicia Vikander redefines the term "gearhead" as the android Ava. A reclusive Internet zillionaire with a God complex creates an alluring android whose self-awareness makes her tragically soulful in this interesting if not completely convincing SF morality tale. 2013's "Her," about a sentient computer operating system that becomes a lonely man's soul mate, was a more satisfying exploration of what could happen when artificial intelligence becomes indistinguishable from the natural kind, and of the gulf that always may separate man from machine even when that day arrives. Programmer Caleb Smith (Domhnall Gleeson) is enlisted by his ridiculously wealthy search-engine-creator boss Nathan Bateman (Oscar Isaac) to spend a week seeing if Nathan's robotic beauty Ava (Alicia Vikander) can pass the "Turing Test." If her interactions with Caleb are believably human, she passes. If not, it's back to the drawing board and the workbench, which would be very bad news for Ava's expanding consciousness. 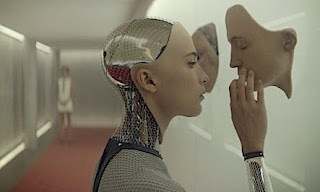 Because most of the drama is limited to that three-person cast in the confined spaces of Nathan's futuristically minimalist compound, "Ex Machina" often feels more like a stage play than a movie. The bald and bearded Nathan seems threateningly sinister even when he's asking the newly arrived Caleb, "Can we just be two guys, not the whole employer/employee thing?" He's also an obvious control freak, except when he's getting pass-out drunk at night. Caleb develops empathy for Ava, who yearns to explore the outside world. Blackouts in the compound's power grid are the only occasions when they believe they can talk freely without fear of being overheard by Nathan's security system. Unfortunately, It doesn't make sense that Caleb wouldn't consider the possibility that an inventor who is capable of creating the next best thing to life itself might also be smart enough to have a backup system, or even that Ava's actions might be controlled by Nathan to test Caleb's loyalty. A bigger plot problem: We are expected to believe that hyper-paranoid genius Nathan would rely on credit-card-style pass keys, instead of a more secure biometrics-based system, to lock and unlock his doors, phones and computers. CGI does a good job of making Ava partly resemble a plastic see-through anatomy model, but why Nathan didn't cover her entire body in synthetic skin and put hair on her head is a mystery, especially if he wants her to pass as human. Also puzzling is why Nathan's mute Asian assistant Kyoko (Sonoya Mizuno) takes so long to react to his abuse. Vikander does an impressive job of making Ava seem both robotically detached and yet touchingly pathetic. Ava's ability to read micro-expressions to determine whether people are telling the truth also gives her an air of quiet but unmistakable menace, never moreso than when she appraisingly asks Caleb, "Are you attracted to me?" Real-world tech titans including Stephen Hawking, Elon Musk and Bill Gates have expressed concerns recently about the potentially disastrous day when machines become smarter than their creators. "Ex Machina" overlays that question with an equally important one dating back to the earliest science-fiction stories: What defines personhood? Ava at one point asks Caleb, "Do you have people that might switch you off?" When he tells her no, she asks, "Then why do I?" It's a question that may need answering sooner than we think.